If you read much of my blog, you will find I am not a normal pastor (and after 10 years still can’t believe I am one) nor am I a normal Christian. I want to be a radical follower of Christ, and that is usually unusual and definitely different here in America. I want the Holy Spirit of God to transform the church for the glory of Jesus Christ and I want to be a part of it. I love missions and mission trips. In 2006 Diane and I went to Buckhannon, WV with Sistersville First United Methodist Church on our first mission trip. 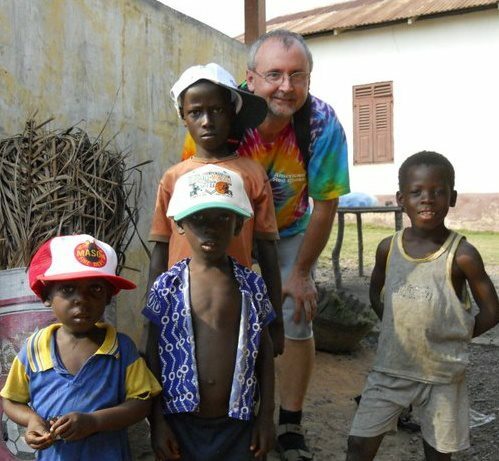 In 2010 we went to Ghana, Africa and lived with an African family for a week. Since then we’ve led teams to New Orleans, Oklahoma, New York, Haiti, South Carolina, and have worked nearly 30 days in south central West Virginia flood relief. My wife Diane and I went to the same United Methodist Church in Sistersville WV for 22 years (from 1985-2007). We were married in that church (in 1986) and both of our sons (Adam – a graduate of Carnegie Mellon University and Matt – a graduate of Brown University) were baptized in the Sistersville church. It was not a call we chose when we were called to move to Mason, but rather a call that chose us. It was difficult to leave the only church we’d attended as a family. We were all involved in all aspects of the church. Encouraged by my pastor at the time, Brian Seders, and the congregation of Sistersville First United Methodist Church, I entered the ministry inquiry process about 2003. I went back to college full time in 2005 to earn my undergraduate degree. 2007 was a pivotal year. I went to Local Pastor’s Licensing School in Huttonsville in the spring of 2007. Matt was entering his freshman year of high school in the fall of 2007, Adam was off to his first year of college, and Diane and I received the appointment to the Mason UNited Methodist Church, our first church appointment. My first six months at the church I was finishing my bachelor’s degree at WVU Parkersburg, attending Seminary at United Theological Seminary near Dayton, OH, and serving as pastor of Mason UMC! I graduated from United in the spring of 2010 with a Master’s of Divinity. I was commissioned as a Provisional Elder in the UMC at the WV Annual Conference in June 2010. It was a hectic three years. The most important thing I learned in seminary is that we must all continue growing in our prayer life, in our devotional life, in our Bible reading, and in our sabbath time. I was ordained as an elder in the United Methodist Church in June of 2013. Diane and I loved our six years serving and serving with the people of the Mason UMC, and the entire Bend Area of West Virginia and Ohio. We appreciate the prayers, love, and support of the church and the people of the area. In July of 2013, Diane and I moved here to the outskirts of Cumberland, MD to serve Jesus with the congregation of Wesley Chapel in Short Gap, WV. We continue to be excited about what God has done and to see what else God does in and through us and the congregation here. God bless you. I just graduated, this past Spring, from Asbury Theological Seminary in Orlando, FL. Loved reading your about section. Keep up the great work! You have an obvious passion for The Lord and good content. I’ll be following. Thanks for the encouragement. I pray that Jesus reaches people through your blog as well.